Home » Buyers Guides » Is your locksmith a cowboy? Cowboys and locksmiths have become an ever recurring theme in this industry casting a shadow over this heritage trade. Locksmiths have been around as long as the modern lock. Although locks were developed in Ancient Egypt, the modern lock as we know it was first developed in the late 18th century by Robert Barron. In the past, it was a privilege to be apprenticed to a master locksmith and to learn the trade. Even today qualified locksmiths should go through extensive training and be registered with official bodies to receive recognition, wherever in the world they operate. Interestingly though locksmiths are a traditional trade – they train and recognise their own. There are no formal UK locksmith qualifications, but to become recognised by the master locksmiths’ association, you are looking at about three years of training, which is similar to other trade apprenticeships. The first way to spot a cowboy locksmith is to see if they are registered with the MLA – The Master Locksmiths Association. We recommend you don’t ask for proof from your locksmith as they could falsify documents to gain your trust. You should call the Master Locksmith Association or check their list of accredited locksmiths. When a person is locked out of their home late at night in freezing weather, asking the locksmith about accreditation is probably the last thing on their mind. When a gas engineer turns up at your house to sort the central heating leak late in the note you will notice his CORGI registration is usually worn around his neck. There is absolutely nothing wrong with asking you locksmith where his accreditation lies. Most people know about gas professionals being registered with CORGI but how many know about locksmiths being registered with the MLA or the SSAIB – Security Systems and Alarms Inspections Board? These are the signs that you are in fact dealing with a professional security company. Choosing a company with these accreditations will ensure you pay for the services of a qualified and recognised locksmith. If letting someone back into their home was as simple as drilling out a lock and replacing it, then anyone could become a locksmith in ten minutes. The fact is that being a locksmith requires skill and knowledge that only comes with training and experience. It is the nature of the service that makes determining whether you are letting a cowboy in or not difficult. In most trades, you can ask for examples of work or references, but when it’s an ungodly hour or a critical situation, then that is the last thing on your mind. Locksmiths such as Lockrite Security are both MLA and SSAIB registered and their registration can be found on these association websites. Every trade has their rogues, whether you are looking at car servicing or computer repairs. The fact is that we live in a world where rogues step in to take advantage of people in crisis. So how do you spot a rogue locksmith? If the first tool they remove from their bag of tricks is a drill, you should question it. Why? Because locksmiths have a variety of tools that they use in different situations. A good locksmith understands different lock mechanisms, how they work, and how to override them. 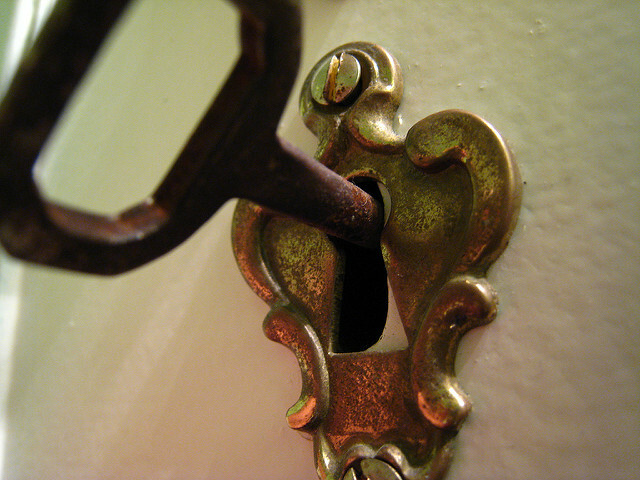 Like a good doctor, your locksmith should first examine the lock to decide on the best course of action. The whole idea behind resolving a situation where a person is locked out of their home or office is to provide re-entry with the least possible damage. An experienced locksmith should be able to pick a lock without damaging the door and in most cases the lock too. Even when your keys have been irretrievably lost the locksmith should pick the locks to get the door open in order to provide a replacement lock – without damaging your door. It is only in extreme cases, for example, when the lock has been vandalised with superglue or a key has been snapped inside the lock that any of the scary looking tools should come out to play. Over the last decade the locksmith industry (like many others) has had its fair share of bad press. The problem of course is that the rogues are not locksmiths. They are people pretending to be a locksmith. These people operate in a very shady world and for the average person in crisis it can be hard to spot and easy to exploit. What you should remember is that they are inherently dishonest. Rogue locksmiths will do anything to steal the business from a real locksmith and some will go to such lengths to copy / steal other company’s identities. It is now very difficult for the uninformed eye to spot a duplicate advert with an altered phone number or a duplicated website. Rogue traders will in fact use the address of a legitimate locksmith but simply change the contact details making it all look above board. A rogue locksmith is not only out to steal from an unsuspecting customer, they steal from legitimate locksmiths too. Across the UK we have had our fair share of these situations. Perhaps one of the most famous was that of Mark Makowski who was sentenced to four years in prison and ordered to repay over £700,000 in fraudulent transactions. This criminal in fact simply continued with his underhand trading even when he was caught and sanctioned repeatedly by trading standards. One of the reasons trading standards struggle to shut these criminals down is because they do not abide by the law in the first place. If they are going to steal from the public and from the trade they are purporting to be a member of, how can you possibly expect them to abide by a trading standards order? This approach however led to Makowski’s demise. Once he had been caught several times carrying on with, “business as usual” by trading standards, the police were called in and a specialist fraud team started to unravel his web of lies, theft and deceit. Eventually there was sufficient evidence to arrest and prosecute him. Makowski was charging more than over the odds too. For a job that should have cost no more than £278 he charged over £1000. It soon became clear that what he quoted over the phone evaporated as soon as he had destroyed the customers lock and they needed a new one installed urgently. Bad locksmiths come in different shapes and sizes and some of the worst are the ones that present themselves as your friendly local neighbourhood locksmith. They turn out to be anything but. As one cowboy locksmith disappears from the trade another is sure to pop up so do your homework on companies you shortlist before accepting a quote. Recently a locksmith registered in Farnborough appeared on BBC watchdog for unscrupulous behaviour. They are not SSAIB or MLA registered, which should be the first sign that something is amiss. Professionals in any field seek recognition from an overseeing body. When they do not show that they are members at least of the MLA, you should politely decline their help and find a trusted locksmith. It is easy to check If the person you are dealing with is legit by going to the MLA website and searching for a locksmith that is local to you. Their website was setup to help consumers and peace of mind is but a few clicks away. You could also do a search online for the person or company name and look at independent reviews to get an idea of the type of company you are dealing with. Alternatively, you could give us a call on [telephone] and talk to a member of our MLA and SSAIB approved team. You would not ask any stranger on the street to come into your home and change your locks. So, when you are inviting someone to effectively break into your home and be paid for the privilege you want to be sure that you are asking an honest person and not a crook. There is nothing more galling than realising you’ve given a criminal access to your home voluntarily. One of the best ways to get a reliable locksmith at a time of crisis is to contact your local police office and ask for someone on their list of contacts. Police statements repeatedly recommend checking the credentials of a locksmith through the MLA website. If for any reason you cannot do this check even on your mobile phone the contact the police. Local rogue traders are more likely to be known to them rather than recommended by them. When calling a locksmith, although they may not be able to provide an exact price until they have seen your lock, they should be able to provide ballpark figure. If the cost exceeds £50 of the original figure you are perfectly within your rights to demand an explanation. When the bill suddenly starts to skyrocket, you should ask some serious questions. The greater cost of having a rogue called to your premises is even higher. How do you know that they haven’t kept duplicate keys to your lock? When they are working on your premises they have access to your home and what other valuables are at risk?